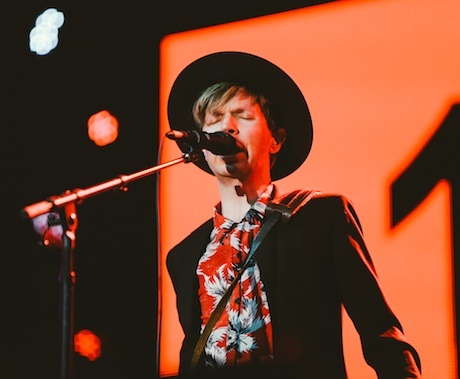 Beck closed out Pitchfork's Friday night (July 18) with a set as odd and varied as his discography. He started in nice and hard on "Devil's Haircut," but there were slight sound issues, his voice sounded just a little tired and the band wasn't nearly as sharp as they should have been on the crucially groove-centric track. "Black Tambourine" was better — it sounded deconstructed without missing anything, a feat that any musician will tell you is difficult to pull off live — but the tune was an odd early choice. Beck's onstage energy seemed muted and held back during "Gamma Ray" and other early songs, as if his full suit and hat were stunting him, but he loosened up as the set went on, commenting on the unusually cool summer weather in Chicago and cheekily poking fun at the publication by suggesting that it was because "the Pitchfork gods are shining down on us." Then, he transitioned from "I Think I'm in Love" into Giorgio Moroder's Donna Summer classic "I Feel Love," paying homage to the producer whose set wrapped minutes before. The set hit its peak midway, as a slightly faster "Lost Cause" retained its gorgeousness and "Loser" shone with the voices of thousands backing Beck up. For some reason, the slower tempos felt more grand compared to the tinny rhythms of the faster tunes, making the dearth of material from his new album Morning Phase (barring a rousing "Blue Moon") more pronounced. "Chemtrails" was a surprising highlight, and a sign that Beck still really loves Modern Guilt — by this point, he'd already played "Gamma Ray" and a solo-filled "Soul of a Man," too. A three-song suite from the new album was another odd set decision. "Heart is a Drum," "Wave" and "Waking Light" were pretty (especially "Wave"), but all in a row, they halted the flow of the proceeding, so while the jump back into "Girl" was refreshing, it exemplified the scattered set list construction. "E-Pro," meanwhile, should have been a highlight, but the guitar tone's thinness kept it from being as stomping as it is on record. The band ended the set laid out onstage as Beck rolled crime scene caution tape across the stage before his guitarist/hype man came out to ask if we felt like "defying some laws." Sadly, even "Sexx Laws," the song to which he was alluding — and a party song if ever there was one — felt lacking. Without horns, the emphasis was missing, and the band scorched through it so fast that it never got the chance to properly groove; even Beck was having a hard time singing fast enough to keep up. They closed with a jammy "Debra" — updated to include lines about Tinder and "not swiping to the right" — and "Where It's At," but while it was nice to see an artist of Beck's veteran status still enjoying himself onstage, the long-winded outro felt like another baffling choice in a set list full of them.